In case of severe anemia or major blood loss, it is a great advantage to have a constant blood supply available. 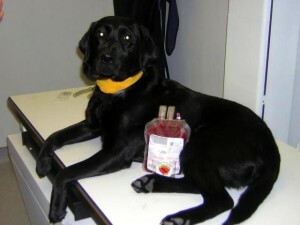 With our blood donor program, we have both canine and feline blood in clinic or within easy reach at all times. Most of our donor animals belong to our doctors and employees who use their own pets. A few other donor animals belong to clients of the hospital who volunteer. We would like to thank our many wonderful donors. Our clients whose pets have been saved by receiving these transfusions join us in sending our thanks out to our generous staff, clients, and their donating pets! Why should your pet be a donor? Veterinary medicine is continually changing, with new advances and discoveries made every day. One thing that has become particularly important is the use of blood and its components for transfusions. Typically it takes only 30 minutes to collect the 450 milliliters of blood needed. One donation can save multiple lives as it can be separated into different fractions for multiple animals or given as whole blood to a single animal. If you decide that you would like your dog to be a donor, all the testing is done at no cost to you. Bloodwork is performed to make sure your dog is fit to donate and complimentary blood typing is done for first-time donors. Collection is relatively simple and causes no visible signs of discomfort for the animal. 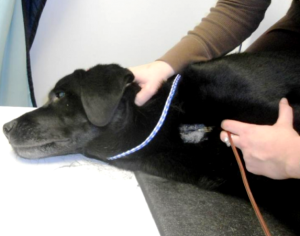 The donor dog will have a small area on its neck clipped and cleaned. The dog is then positioned, most often lying on one side but sitting or standing quietly is fine as well. Once the collection bag is set up, the needle is advanced from the body towards the head into the jugular vein. The collection bag is then rocked back and forth to draw the blood out and is weighed often throughout the process. Once 480 grams (or 450 milliliters) are collected, the needle is withdrawn and pressure is held to the donor’s neck for 2 minutes then wrapped for another 30 minutes. Animal donors, just like their human counterparts, are fed lots of yummy treats after their donation and receive plenty of praise! We do need blood from cats from time to time, but we are not currently recruiting donors from our patients. Because of the somewhat unpredictable nature of cats, we use some of our own pets. Cats have multiple blood types just like dogs do. Blood types for cats are type-A and type-B. Type-A blood is more popular due to the majority of mixed breed cats. The majority of cats with type-B blood are purebred cats. Cats can have very severe reactions to foreign blood, so it is always a good idea to cross-match blood types before a transfusion. Whole blood consists of red blood cells and plasma, which can be separated and used differently. Plasma is made up of clotting factors, platelets, and occasional white blood cells. It can be stored for a year as Fresh Frozen Plasma (FFP) and for four years as Frozen Plasma (FP). FFP contains all clotting factors, whereas FP has lost some because of prolonged storage. They are used in dogs with bleeding disorders. Whole blood and Packed Red Cells (PRC) can be stored up to 30 days. They are administered in the event of severe blood loss or in anemic animals.